The good news from the US Open for American tennis fans came late Wednesday, after a downright depressing first eight hours. Sloane Stephens, seeded No. 21, went out in the second round to WTA No. 86 Johanna Larsson of Sweden 5-7, 6-4, 6-2, despite leading 3-0 in the second set and 2-0 in the third set. Steve Johnson was up 2-6, 6-3, 7-5, 1-0 against qualifier Tatsuma Ito of Japan when he began cramping, and after taking two game penalties for time violations and losing the next two games, barely able to hold the racquet, he retired. Johnson discussed in his press conference the seemingly random nature of the cramps, saying the onset took him completely by surprise. Ryan Harrison went out to No. 7 seed Grigor Dimitrov 6-2, 7-6(4), 6-2 in the first round, and wild card Madison Brengle lost to No. 26 seed Sabine Lisicki 6-4, 6-1 in the second round. So Americans were 0-4 in singles until No. 20 seed Venus Williams defeated Timea Bacsinszky of Switzerland 6-1, 6-4 in a second round night match. 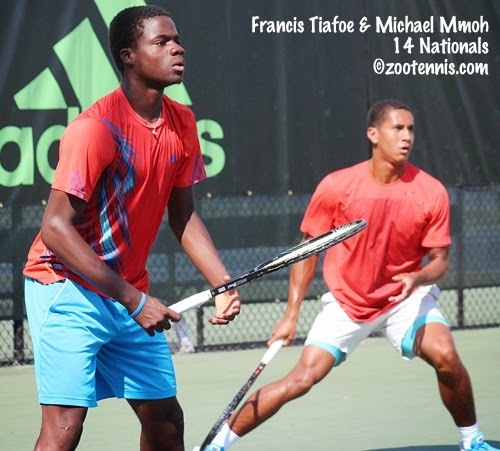 Just before that match finished however, 16-year-old wild cards Francis Tiafoe and Michael Mmoh picked up their first grand slam win, defeated Victor Estrella of the Dominican Republic and Teymuraz Gabishvili of Russia 6-3, 6-4. Tiafoe and Mmoh had no idea they were going to receive a wild card into the men's doubles, and Tiafoe had returned to College Park, Maryland to prepare for the Junior Championships after playing in his first round men's qualifying match in New York last Wednesday, planning to return to New York today or tomorrow. Mmoh, who had just lost in the semifinals of the ITF International Hard Court Championships at College Park, was preparing to return to Bradenton for a few days before the US Open Juniors, but all that changed when they went to the US Open website, tipped off by twitter, to see their names on the wild card list for men's doubles. Once they confirmed, the frequent doubles pair rearranged their travel schedules and went to New York on Monday. They were broken only once in the match, in the second set, although they were required to save nine break points. Immediately after they were broken, they broke right back then held for the win. They will play the winner of the match between Scott Lipsky and Rajeev Ram, who meet No. 15 seeds Jamie Murray of Great Britain and John Peers of Australia tomorrow. Eleven Americans are on the singles schedule for Thursday, including CiCi Bellis, who plays 20-year-old Zarina Diyas of Kazakhstan fourth on Court 17. Free live streaming of that match and many others can be found by clicking the red Watch Live button at usopen.org. 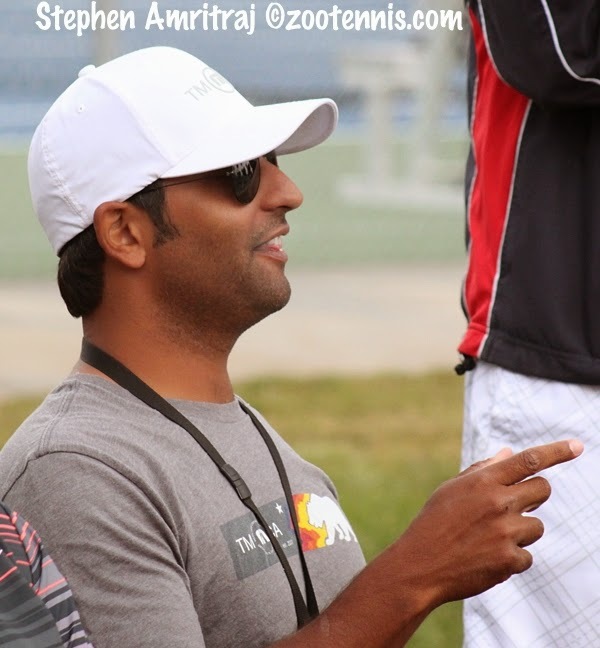 I heard a couple of days ago that Stephen Amritraj, currently a USTA National Coach in Carson, California, will be taking over Dustin Taylor's position as National Coach for Collegiate Tennis, beginning September 1. I spoke at length with Amritraj, who played his college tennis at Duke, this past April when I was in Carson, and he is certainly passionate about and committed to college tennis and its current and former players. I'm sure I'll have additional opportunities to talk with him about his plans for the position next week at the American Collegiate Invitational at the US Open. 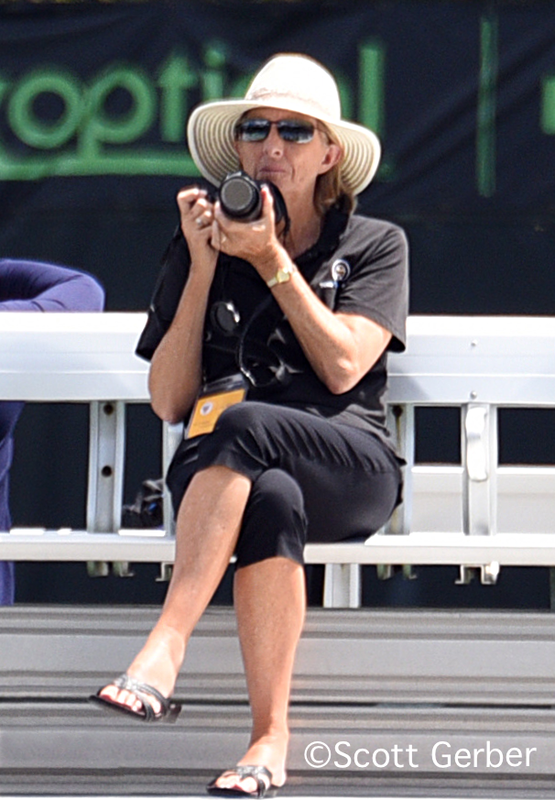 Colette, are you reviewing the US Open qualifier? Feel like you skipped over it? 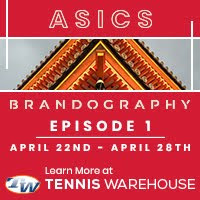 Because I was in Maryland, covering the Int'l Hard Courts tournament for the 1st time during USO qualifying, I wasn't able to go as much in depth as I usually would. I tried to fit it some coverage of the young Americans, but that's it for this year.